The Urban Street Stormwater Guide begins with the idea that street design can support the urban area’s overall environmental health. By incorporating Green Stormwater Infrastructure (GSI) into the right-of-way, cities can manage stormwater and reap the public health, environmental, and aesthetic benefits of street trees, planters, and greenery in the public realm. And with thoughtful design, GSI can bolster strategies to provide a safe and pleasant walking and biking experience, efficient and reliable transit service, and safer streets for all users. The state-of-the-art solutions in this guide will assist urban planners and designers, transportation engineers, city officials, and others working to incorporate stormwater management techniques into the urban streetscape. 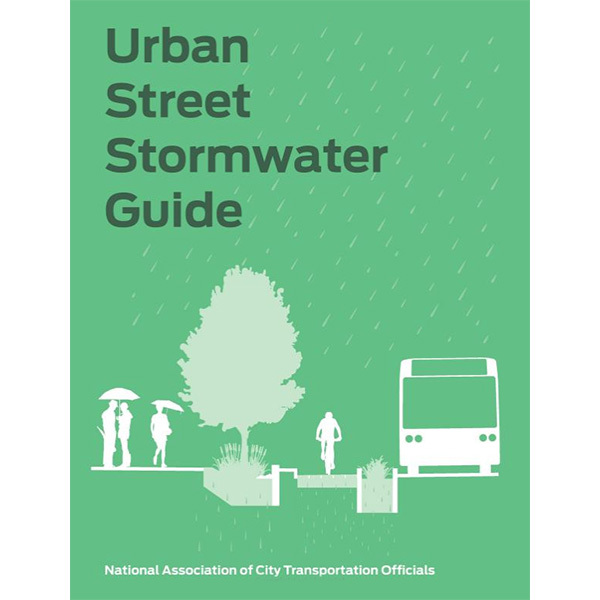 Urban Street Stormwater Guide was prepared by a team of researchers at the National Association of City Transportation Officials with input from directors of planning, public works, transportation, and urban design from across North America. Urban Street Stormwater Guide is guaranteed. If you are not 100% satisfied, you may return it within 30 days for a full refund.